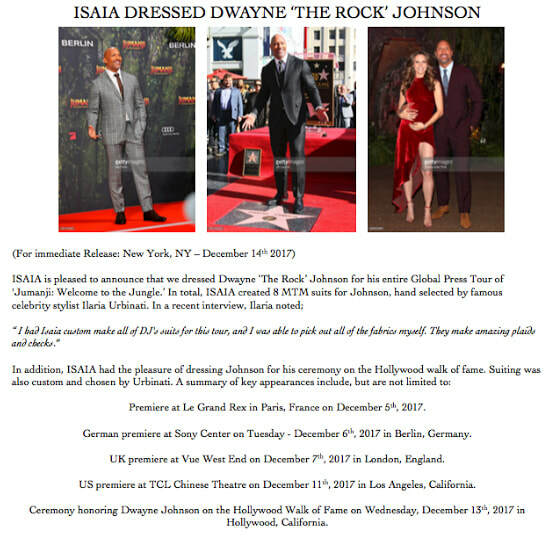 ISAIA had the pleasure of dressing Dwayne 'The Rock' Johnson for his global press tour of Jumanji: Welcome to the Jungle. In addition, ISAIA also created custom suiting for Johnson's ceremony honoring him on the Hollywood Walk of fame. ISAIA worked directly with famous celebrity stylist, Ilaria Urbinati to pick out all of Johnson's fabrics creating custom looks tailored especially for him.